Michigan Gov. Rick Snyder signed a bill into law prohibiting any state agency in Michigan from cooperating with the U.S. military if it attempts to indefinitely detain a U.S. citizen without due process. 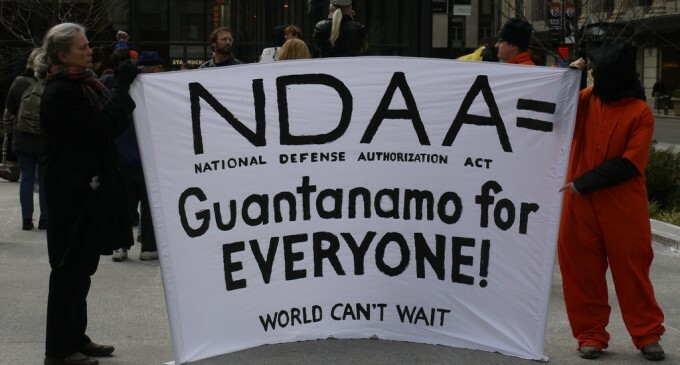 The NDAA is an unconstitutional, Orwellian law that allows the federal government to detain citizens indefinitely without a trial. Kudos to you Governor Snyder! With a few pen strokes, Michigan Gov. Rick Snyder took the first step in getting the Great Lakes State out of the indefinite detention business. On Thursday, Snyder signed bill prohibiting any state agency in Michigan from cooperating with the U.S. military if it attempts to indefinitely detain a U.S. citizen without due process. The bill unanimously passed the Senate 37-0 last March and gained House approval 469-109 earlier this month. Sen. Rick Jones (R – 24th) sponsored the bill. Rep. Tom McMillin (R – 45th), a vocal supporter for blocking state cooperation of indefinite detention, was instrumental in getting the bill through the House. “Pushing back against the feds is important. Michigan now joins Virginia, California and Alaska. Congrats to all who helped over the last two years to make this happen – like Dennis Marburger, Justin Amash, Shane G Trejo, David A. Dudenhoefer, Bill Sage, Mike Maharrey and Tony DeMott. Thanks also to Lt. Gov. Brian Calley for helping me get it through the legislature and working with the governor’s office to ensure he and his legal staff understood the issue and was comfortable signing it,” McMillin said in a Facebook post. Jones said the new law fits well into Michigan’s tradition of protecting basic due process. By refusing to cooperate with provisions written into the NDAA, Michigan will make it much more difficult for the feds to indefinitely detain somebody in that state. The federal government almost always depends on state and local cooperation. This bill would strip that away. As Judge Andrew Napolitano said recently, such widespread noncompliance can make a federal law “nearly impossible to enforce” (video here). Tenth Amendment Center national communications director Mike Maharrey called the bill a great first step, but noted more work remains in Michigan to fully nullify indefinite detention. b) Create an express prohibition on the use of any local government assets – funds, employees, and the like – to provide material support for or participate in any way with federal indefinite detention. Once the state is blanketed with localities which have passed such measures, the practical effect would be even stronger than if SB94 had ordered them to do the same. Reaching this point would mean that support for the effort would be well into the mainstream around the state, and that resolve to ensure the resistance continues to victory is likely much stronger. Another criminal organization put in place by our terrorist in chief! arrest and convict everyone who unconstitutionaly passed this bill. 49 other states should adopt such a law…. Aw, stop whining. Shoot back or shut up! The founder did !! All states should do this !